Preheat oven to 170 deg C.Line a 6" cake tin with parchment paper. Soak dry fruits and nuts in orange juice / red wine overnight or at least for a few hours. 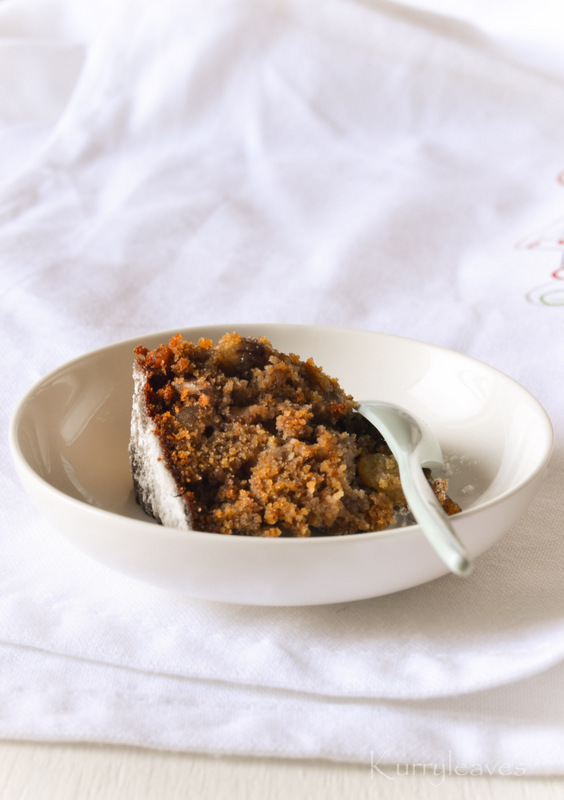 In a large mixing bowl ,whisk together whole wheat flour,baking powder,baking soda,salt,cinnamon and nutmeg until combined,Add soaked dry fruits / nuts and orange zest to this . mix lightly until combined. In another bowl combine together vegetable oil,sugar,orange juice,water and vanilla extract.Mix well until combined. Add the combined wet ingredients into the dry ingredients along with the flax seed mixture .Mix gently until combined,Do not over mix. Pour this batter into the prepared cake tin and bake for about 35 to 40 minutes or until a cake tester inserted into the center of the cake comes out clean. I used 1/2 cup black and golden raisins,and 1/4 cup cashew nuts /almonds.You can use any dry fruits or nuts of your choice.For best results soak the raisins and nuts in red wine for about 24 hrs.Increase the amount of sugar to your taste if you are not using raisins. To improve the flavor add 1/4 tsp ginger powder to the dry ingredients. You can substitute light brown sugar with 1/4 cup grated jaggery and 1/4 cup granulated sugar combined together .If you are completely replacing sugar with jaggery ,then you may have to use 3/4 cup grated jaggery.I have tried this recipe with 3/4 cup jaggery and it came out perfect and it is healthy too. Double the recipe for a larger cake. To enhance the flavor of ,let the cake cool completely ,prick holes on the top of the cake with a skewer and brush/drizzle wine over the cake. Thank You dear! !Happy Christmas to you..
Who can resist to this attractive,moist and beautiful cake, stunning.Belated Xmas wishes. 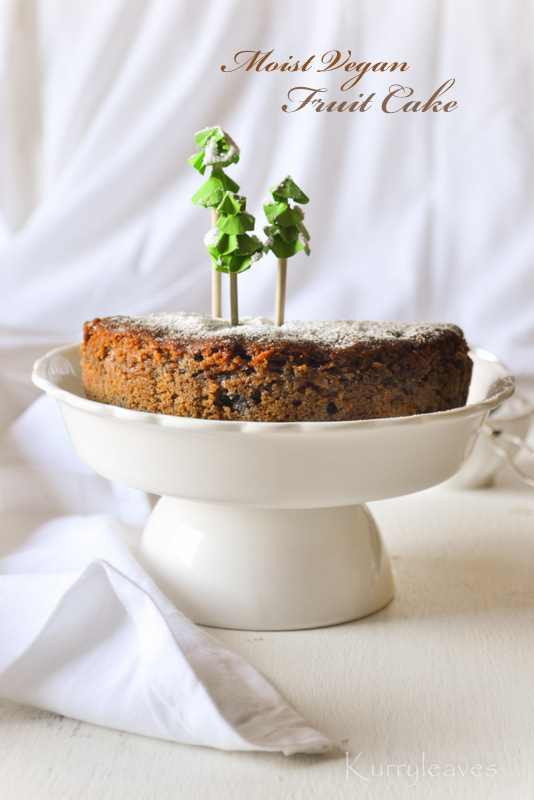 Love those cute Christmas trees sitting on top of your cake. 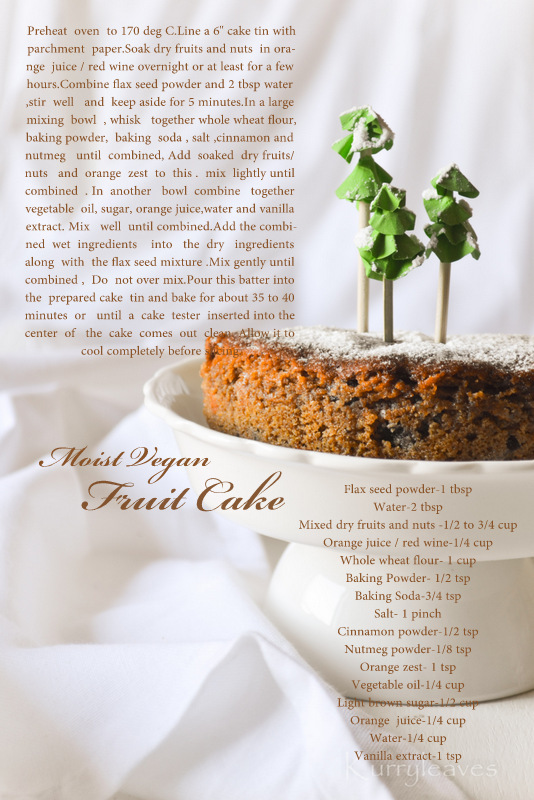 Vegan moist cake surely makes me tempted and drool! A lovely fruit cake and I love your little trees. Tried and loved this cake. It was mild and moist. Wonderful. Thanks for sharing..